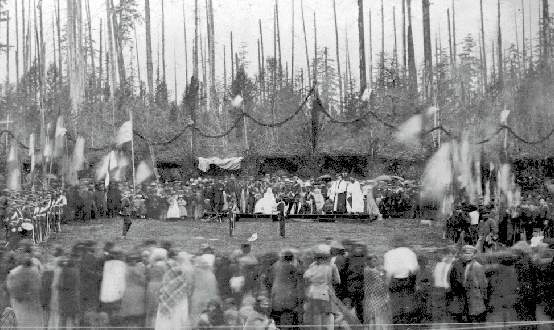 New Westminster, July 16, 1866, Colony of British Columbia. Mrs. Seymour, the Governor's wife, presents the Regimental Colours to the newly formed Seymour Artillery Company. "As you are aware, the Regiment has an affiliation with the R.E's not just because they both are in New Westminster but the R.E's are the forefathers and members of both the New Westminster Rifle Company, Number 1 and the Seymour Artillery Company. It would make sense that the remaining and local populace would want some sort of protection locally after the R.E. departed. "Specifically, in 1863 the rifles consisted of 73 personnel. Upon reviewing the nominal roll in the G.O's - 6 R.E. 's names are listed. "Later when the Seymour Artillery Company is formed, in 1866, there are 5 R.E's names listed. There was also a Home Guard formed at the same time as the Artillery. "I have noted that there is some information listed on your website, under the Rifles and Artillery Company, that are misleading or unfortunately the sources are inaccurate. I hope you can amend your site to correct these misinterpretations. "I can tell you from first hand knowledge that when you do do the research some of the information that has been presented in the past has had many assumptions made. For example, in many local readings it states that the NWRC, No. 1 consisted of 73 personnel mainly of Royal Engineers. When in actually primary source documentation comparing Enrolment documents of the Columbia Detachment and the Rifles there is only 6 R.E's. Still 73 personnel is impressive considering the size of the colony and the funding they received. Under the NWVR page it indicates the following: unit called New Westminster Volunteer Rifles. Their actual name was New Westminster Rifle Company, Number 1. However, locally they were referred to as the NWVR. Upon the colony joining confederation the British colonial units ceased to exist. After the military district was founded in 1871, then Canadian military units were formed, within the Number 11 Military district. Therefore, on the 13th of Feb 1874 -3 units were formed the Number 1 Company of Rifles, New Westminster; Number 1 Company of Rifles, Nanaimo and the Number 1 Company of Rifles, Victoria. In the 1874, the Seymour Battery of Garrison Artillery was formed to support the local infantry units. Their non garrison artillery pieces being the Crimean Field howitzers issued to the Seymour Artillery Company. Note. This pieces have been refurbished by the Royal Westminster Regiment Association and will be presented back to the City of New Westminster at a ceremony on the 22 May 04. They are to be placed near the current cenotaph. In 1877, 110 men from New Westminster and Vancouver went to deal with the Nanaimo Coal mine strike at the Wellington mines. Note: I have yet to find information on how many went from New West and what units they were from and who. Number 4 Battery - Number 1 Company of Rifles, Victoria. The Number 1 Company of Rifles, New Westminster continue to parade alongside the artillery. On the 24 April 1877, the Rifles saw some change. The Number 1 Company of Rifles, New Westminster was renamed the New Westminster Rifle Company. Information about this change is actually connected to Joseph Burr (great-grandfather of Raymond Burr (actor-"Ironsides"). It seems that at this time Officers were still elected by the men. The men did not agree with J. Burrs appointment an expressed there displeasure in his appointment (mutiny?). He was removed and the Company had its name changed. In 1886, the Provisional Regiment was changed to the British Columbia Brigade of Garrison Artillery. Number 1 Battery remained the Seymour Battery. There is no reason mentioned in the General Orders why this occurred however two prominent militia men had discussed this option before - Dupont and Wolfenden. Wolfenden was the CO of the Victoria Rifles but is the same Wolfenden who was the first Company Sgt Major of the New Westminster Rifle Company, Number 1. He is the same Cpl Richard Wolfenden of the Columbia Detachment, R.E. 's Queens printer. While a member of the NWR Company he took his Officer's commission. When the government an capital was moved from New Westminster to Victoria he moved there as well. He joined the Victoria Rifles. In 1892, because of the decline in parading and the disrepair of equipment sadly the New Westminster Rifle Company was removed from the Active List. Between 1888 and 1893, there were concerns about the manning of the Esquimalt fortifications. Esquimalt was home to the Royal Navy Dockyards and home of the Pacific Station for the Pacific Squadrons. A major strategic port for the Navy --both Canada and England. Therefore, it was decided that British gunners would provided the majority of the personnel there. From Aug 1893 - 1906. Therefore, the militia was reorganized to become the British Columbia Battalion of Garrison Artillery. Less men required. This renaming caused quite a stir for the Seymour Battery was renumbered as number 4 Company not number 1 company. The company was disbanded (mutiny?). During it's intermission. The artillery was reorganized again and the 5th British Columbia Battalion (Bn) of Garrison Artillery (GA) was formed. Number 4 Company, 5th BC Bn of GA was formed in April 1895. This lasted not even a year. 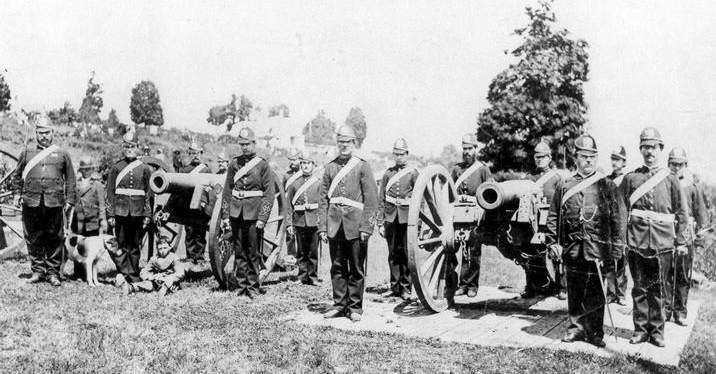 In 1895, the artillery were finally issued a Garrison Artillery piece (29 years after the formation of a garrison artillery company). A 64 lb Rifle Muzzle Loader (RML) gun with a land base carriage. Each Company on the mainland got 1 gun. The same gun which resides in front of our armoury. (That is the reason why there is two 64 RML parked in front of the Beatty Street Armoury, Vancouver- Number 5 and 6 Company's). In 1896 another reorganization took place and the 5th BC Bn of G.A was formed into two Bn's - 1 Bn on the Island and 2nd Bn on the mainland. At this time the Seymour Battery was renumbered- Number 1 Battery, 2nd BN, 5th BC Bn of GA. In 1896 the artillery occupied the present day armoury in New West. Since there was more of a requirement to provide infantrymen to protect the fortifications than qualified artillery men. The Royal Marine Artillery and Royal Garrison Artillery providing the gunnery personnel. The 2nd Bn, 5th BC Bn of G.A. was converted in its role to infantry. On 1st of August 1899, the 6th Bn of Rifles was formed with a complement of 15 Officers and five hundred men. You can now see why there is so much disagreement and confusion to who is the oldest unit, units form, changes etc. If you require the specific G.O. 's I can provide them for you. I have never seen mention of the New Westminster Artillery Battery." Captain MacKinnon closed with the recommendation Arthur Bishop's account of Canadian VC winner Filip Konowal is inaccurate, and that "Cpl Filip Konowal was awarded his VC while serving with the 47th CEF Bn during WWI." The reason Mr. Bishop's account is inaccurate is due to quoting from a secondary source -- an appropriate caution to any researcher. Double check your sources. 1866 - July 16 - Seymour Artillery Company formed, due to threats from U.S.A. from Fenian groups. First drill shed built for the Volunteers, who also had the use of a brick and stone magazine left by the Engineers. These buildings were kept up by the Volunteers, who also paid for their uniforms and were unpaid. The Government supplied rifles and ammunition only. Enthusiasm in local defense was revived with the Fenian scares. The Fenians were groups of Irish Americans who, after the American Civil War, decided to invade and conquer Canada and use it to trade to free Ireland from Britain. Several actual invasions took place in the Niagara peninsula and battles were fought between the Fenians and the British Regulars and Canadian Militia. Locally, a force of Fenians arrived in San Francisco and were trying to hire a boat to sail North. They were unsuccessful. Murray - " No. This is not a RE belt left behind. I don't know exactly what it is, but it is not a RE belt. Just previous to Governor Seymour arriving, there was a company formed called the Seymour Artillery, and the belts, pouches and sword (bayonet) and rifles formerly belonging to the RE, which had been left behind, were served out to the Seymour Artillery. I know, because Father was one of the principles in the Seymour Artillery, and I saw it done. I remember when the uniforms were made by one of the tailors in New Westminster, Tommy Walsh, Thomas Walsh, who had been in the RE and they (Seymour Artillery) were the ones who received Governor Seymour on his arrival at the Camp; that was where the arch was erected for him to pass under; they made it of all kinds of flags, evergreens. But this is not one of the RE belts." son of Sapper John Murray RE. RE Rank Sapper Allan Cummings (or Cummins). Become Trumpeter in SAC., 16th July 1866. Is a blacksmith in new Westminster from 1876-77. Takes the land grant 150 acres. RE Rank Sapper John Linn (Lynn) - gets a Crown grant of 40 acres. Serves in the NW Rifles and the SAC. Corporal, 16th July 1866. RE Rank Lance Corporal John Murray - takes the 150 acre land grant. A shoemaker in the New Westminster till 1882 when he moves to his grant which he subdivided forming Port Moody! Serjeant, 1866 in SAC. Son, Hugh, born on the Thames City in 1859. RE Rank Lance Corporal George Turner - was a surveryor with William McColl. marries McColl's Widow, 1869. Serves in SAC. become president of the BC Land Surveyors. Lancelot newton, Acting Bombardier, 16th July 1866. 1867 - Two bronze Field Cannons and other equipment sent from England, arrived by H.M.S. "SPARROWHAWK" September 15th. The War Office provided guns, rifles, ammunition and accoutrements complete for this unit, and a Drill shed for them was built for them at New Westminster at the cost of $1,400. 1871 - October 16 - B.C. joined Canada, and was designated Military District No. 11. All units then became part of the Canadian Militia, but there was little assistance from the Federal Government for many years. 1874 - February 13 - New Westminster Volunteer Rifles designated as No. I Company of Rifles in Military District No. 11. The Seymour Company became the Seymour Battery of Garrison Artillery, with no garrison type guns. The Seymour Battery of Garrison Artillery at "The Battery" southeast of Albert Crescent in New Westminster. This photo was taken between 1878, when the men acquired spiked helmets, and 1886 when the helmets were replaced by busbies. 1883 - October 12 - All Militia units in B.C. were formed into the B.C. Provisional Regiment of Garrison Artillery, with No. 1 Company in New Westminster, and Nos. 2, 3, and 4 in Victoria. The New Westminster Rifles and the Victoria Rifles became Artillery units on paper, but there is little evidence that the New Westminster unit changed from its Rifle status for some years." The Seymour Battery became Number 1 Battery on the 12th October, 1883, when our Regiment officially was entered on the roll of Battle.